Understanding the Social Security tax and the Medicare tax is critical for payroll accounting. In this section we discuss the employers' portion of the Social Security tax. In addition to the amount withheld from its employees for Social Security taxes, the employer must contribute/remit an additional amount, which is an expense for the employer. In the year 2019, the employer's portion of the Social Security tax is 6.2% of the first $132,900 of an employee's annual wages and salary. For example, if an employee earns $40,000 of wages, the entire $40,000 is subject to the Social Security tax. This means that in addition to the withholding of $2,480, the employer must also pay $2,480. The combined amount to be remitted to the federal government for this one employee is $4,960 ($2,480 of withholding plus the employer's portion of $2,480). For an employee with an annual salary of $200,000 in the year 2019, only the first $132,900 is subject to the Social Security tax. This means that in addition to the withholding of $8,239.80, the employer must also pay $8,239.80. The combined amount to be remitted to the federal government for this one employee is $16,479.60 ($8,239.80 + $8,239.80). The employer's share of Social Security taxes is recorded as an expense and as an additional current liability until the amounts are remitted. In addition to the employee's Medicare tax there is also an employer's Medicare tax. The employer's Medicare tax is considered to be an expense for the employer. For the year 2019, the employer's portion of the Medicare tax is the same rate as the employee's withholding—1.45% of every dollar of each employee's annual wages and salary. Unlike the Social Security tax, there is no cap (ceiling or limit); if an employee earns a salary of $200,000, the employer must pay a Medicare tax of $2,900 in addition to the $2,900 that was withheld from the employee. The combined amount to be remitted to the federal government for this one employee is $5,800. The employer's share of Medicare taxes is recorded as an expense and as an additional current liability until the amounts are remitted. Generally, states require that the employers pay the entire unemployment tax. Often, employers that have built up a large reserve in the state's unemployment fund will have lower unemployment tax rates. Employers with a small reserve (or no reserve at all) will have higher unemployment tax rates. The state unemployment tax rate is applied to a wage base that is determined by each state. (The wage bases range from $7,000 to more than $30,000.) If a state's unemployment wage base is $14,000 then the state unemployment tax rate is applied only to the first $14,000 of each employee's annual salary and wages. If we also assume that an employer's state unemployment tax rate is 4%, then the employer's state unemployment tax cost will be a maximum of $560 per year for each employee ($14,000 x 4%). Even though the state unemployment tax is based on employee salaries and wages, the entire tax is paid by the employer. There is no withholding from an employee's salary or wages for the state unemployment tax. You should contact your state to get the rates that apply to your company. The federal government oversees the state unemployment programs and requires employers to pay a federal unemployment tax of 6.0% minus a credit if the employer has paid into a state unemployment fund. If an employer is allowed the maximum credit of 5.4%, then the federal unemployment tax rate will be 0.6%. This rate is then applied to each employee's first $7,000 of annual salaries and wages. Even though the federal unemployment tax is based on employee salaries and wages, the entire tax is paid by the employer. There is no withholding from an employee's salary or wages for the federal unemployment tax. Worker compensation insurance provides coverage for employees who are injured on the job. State law usually requires that employers carry this insurance. Worker compensation insurance rates are a function of at least three variables: (1) the type of business or industry, (2) the type of job being performed, and (3) the employer's history of claims. For example, statistics show that a production worker in a meat packing plant has a greater-than-average chance of suffering job-related cuts or back injuries. Because of this, worker compensation insurance rates for these employees can be as high as 15% of wages. On the other hand, the office staff of the meat packing plant—provided that they do not venture out into the production area—may have a rate that is less than 1% of salaries and wages. If the employer pays the premium in advance, a current asset such as Prepaid Insurance is used. The account balance will be reduced and Worker Compensation Insurance Expense will increase as the employees work. If the employer does not pay the premiums in advance, the company must accrue the expense with an adjusting entry that increases Worker Compensation Insurance Expense along with increases in a current liability such as Worker Compensation Insurance Liability. In this situation the current liability will be reduced when the employer pays the worker compensation insurance premiums. Worker compensation insurance is a significant expense for the employer and therefore we consider it an important part of payroll accounting. In the past, many companies included group health, dental, vision, disability, and life insurance in the benefit package provided to employees. Over the past few decades, however, the cost of these group policies has risen significantly. Today the insurance premium for family coverage could be more than $10,000 per year per employee. As a result of these escalating costs, most companies now require employees to pay a portion of the premium cost; this amount is usually collected by means of employee-directed payroll withholding. The employers' net cost (or expense) is simply the total amount of premiums paid to the insurance company minus the portion of the cost the employer collects from its employees. Many companies pay their permanent employees for holidays such as New Year's Day, Memorial Day, July 4th, Labor Day, Thanksgiving, and Christmas. It is not unusual for employees to be paid for 10 holidays per year. It is also common for employees to earn one week of vacation after one year of service. Many employers give their employees two weeks of vacation after three years of service, with more weeks given after 10 years of service. Paid sick days are also a common benefit given to employees. If an employee is absent from work due to such things as illness or surgery, the company will pay the employee for the time missed. Employers generally set policies as to how sick days are to be used, and as to whether or not an employee is permitted to carry over unused sick days into subsequent years. To illustrate, assume that an employee works full-time for the entire year 2018 and as a result earns one week of vacation to be taken any time during the year 2019. During the year 2018 (when the employee is working), the employer records the vacation expense and the vacation liability. In 2019, when the employee takes the vacation earned in the previous year, the employer records the cash payment by crediting Cash and reduces the company liability by debiting Vacation Payable. If an employer is required to contribute company money into an employee's savings program or profit-sharing plan, the contribution should appear as an expense in the period when the employee earned the company contribution. It is also likely that the company will have the expense and the liability before the company actually pays the amount. This situation requires the company to record an adjusting entry in order to match the expense to the proper accounting period. Some companies provide pensions for their employees. This means their employees will receive ongoing monthly payments after they retire from the company. The matching principle requires that the cost of the benefit should be recognized during the years that the employees are working (earning the benefit), and not when the employee is retired. Note: In effect, pensions (and other benefits) are part of the compensation package given to employees working at a company. While some parts of the compensation package are paid out during the time the employee is working, other benefits are deferred until the employee is retired. The cost of the entire compensation package, however, must be expensed or assigned to products manufactured when the employee is working, so that the cost of the employee's work is matched with the revenue resulting from the employee's work. The concept is that in the years that the employee works, the company will charge Pension Expense and will credit either Pension Payable or Cash. 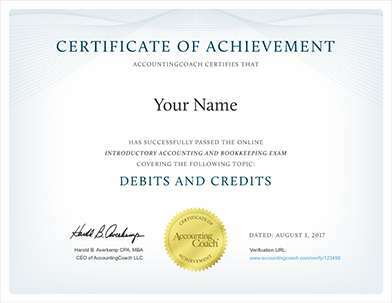 For more specifics on pensions, you are referred to an Intermediate Accounting text or to the Financial Accounting Standards Board's website www.fasb.org. Some companies continue to provide health insurance coverage to employees after they have retired. This retiree benefit is considered to be part of the compensation package earned by employees while they are working. Again, accrual accounting and the matching principle require that the cost of this future insurance coverage be expensed (or assigned to manufactured products) during the years the employees are working by debiting an expense and crediting a liability. During the employees' retirement years, the company's payment for insurance will reduce the company's liability and will reduce its cash. To learn more on the accounting for post-retirement benefits, such as health insurance coverage, you are referred to an Intermediate Accounting text and/or to the Financial Accounting Standards Board's website www.fasb.org.